CellarPro's 4000S cooling units (1/2 Ton Nominal) are suitable for wine cellars up to 1,000 cubic feet in both commercial and residential wine cellars. The 1,000 cubic feet cellar size assumes that the cellar is constructed with insulation of R19 or better in all walls and ceiling (ie no glass or uninsulated concrete), the cooling unit is not ducted, a setpoint of 55°F inside the cellar and ambient temperatures up to 85°F outside the cellar. Performance testing shows that this unit maintains optimal cellar temperature and humidity conditions in extreme conditions up to 110°F more effectively than similar units from competing brands. 4000S units also are significantly quieter than comparable units from other brands. Visit our Learning Center for data tables, performance charts and product comparisons among different brands. CellarPro 4000S Cooling Unit (P/N 1763). CellarPro engineered the 4000S cooling system to provide maximum cooling power and adjustable humidity control for cellars up to 1,000 cubic feet. Split refrigeration systems separate the evaporator from the condensing unit, allowing the noise and heat from the condensing unit to be located away from interior living areas. Configurable for internal or external installations, the 4000S includes a variable-speed fan on the evaporator with a low setting for quieter operation and a high setting for maximum power. This unit is designed to separate the heat and noise from the condensing unit from interior living spaces, and can be configured to operate indoors or outdoors in extreme temperature conditions ranging from -20 to 110F. CellarPro 4000S units are designed to be installed with the evaporator inside the cellar, and the condensing unit in a remote location. The Condensing unit can be electronically controlled by and wired to the Evaporator (single power source on the Evaporator side). This configuration allows the Condensing unit to be used in temperatures down to 20F with the addition of our compressor heater, or down to -20F with the addition of our fan cycling switch AND compressor heater. This configuration requires a 15-amp dedicated circuit breaker for 3000S and 4000S systems, and a 25-amp dedicated circuit breaker for 6000S and 8000S systems. 4000S evaporators can be located remotely from the cellar with the addition of one of our front duct packages. Offered with or without insulated flex ducting, in a choice of configurations for low or high humidity conditions, our front duct packages allow these cooling units to be ducted up to 50 equivalent feet away from the cellar and requires 8-inch (or greater) ducting from start to finish. Warranty:2 Years (Entire System) To activate your warranty, you must complete and return our Split Installation Checklist. Duct Hoods (Cold Side) (#7408 for low-humidity environments or #7427 for high-humidity environments) and Kits (#1476 for low-humidity environments or #7426 for high-humidity environments): permits the evaporator to be located remotely, up to 50 equivalent feet away from the cellar. Duct Kits are the same as Duct Hoods and also include 2 x 25-feet of 8-inch insulated (R-6) flex ducting. Outdoor Hood #2011: allows you to install the condensing unit outdoors; all outdoor hoods include a Compressor Heater #1727. Bottle Probe #1434: this remote thermostat with a 10-foot cord overrides the thermostat on the face of the evaporator, and allows it to monitor air or liquid temperatures at various locations inside the cellar. 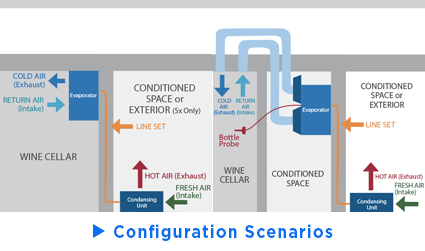 Can the evaporator be located in a remote location and ducted to/from the wine cellar? A: These evaporators can be ducted up to 50 equivalent feet away from the wine cellar when used with our cold-side (front) duct hoods and kits. Remember that cold-side ducting must be insulated and additional load should be added to properly size the required cooling unit. We want to put a wood grill in front of the evaporator, what is the percentage of air flow that grill will need to have? A: Our units require 1/2" minimum spacing, as well as a baffle behind the grill to separated the cold air discharge from the coil intake. We have seen problems with custom grills where there is a gap between the unit and the grill and it causes air circulation behind the grill resulting in coil icing. It is also important to note that the evaporator must be mounted to the interior cellar wall, not buried inside the wall. If it is buried inside the wall, the housing will require insulation, otherwise condensation and heat loss issues will occur. A great system. Vastly superior to our previous unit Whispwr Kool . The installation is complete, This unit is head and shoulders above the Breeze Air unit I removed. The unit started up well and no problems encountered. My amp meter had a malfunction and I got no readings from it and assumed full load at start up with a 75 degree room and 90 degrees outside. I have not installed the unit yet, but I was disappointing to discover I will need to reach into the evaporator cabinet, and braze fittings onto the stubs to increase to the line sizes required. To me, this is sloppy manufacturing. You know what the line size needs to be. Why not give me some nice flare connections in the size I need? That way I wont be trying to braze inside a little metal box with an acetylene torch. Thank you for your feedback. Flare connections are much more leak prone and have been phased out over the years, replaced by fully brazed connections. This is driven by the EPA and the focus on minimizing refrigerant leaks into the atmosphere. The stubs inside the unit allow flexibility in routing the lines. Adapters and bushings are commonly used in refrigeration piping. Good afternoon. The install went great and the unit is quiet and I have happy clients, thanks to CellarPro and the great products you make! Can I get some color brochures? I have a lot of clients that are looking at getting wine closet’s or cellar’s in their home, and any good product info will be good from your company. - Outdoor: 62 2 Years (Entire System) To activate your warranty, you must complete and return our Split Installation Checklist.